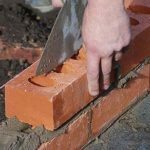 We recently updated our guide to damp proof prices in the UK (that can be found here) and then decided it would be a good time to tackle another problem often experienced in winter – loft condensation. 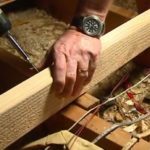 This page is all about loft condensation, when you shouldn’t worry and some examples of when you should be concerned enough to take action. 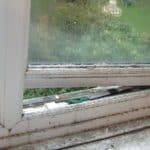 If you’re suffering from condensation on your internal walls and windows, you’ve come to the wrong page and you should read this guide instead. 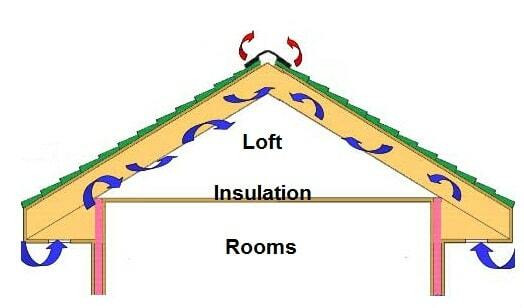 The loft spaces above most homes in the UK are designed to be cold, insulation is placed above the ceiling and this keeps the home below warm and the loft above cold. But, as you are probably aware, when moisture comes into contact with a cold surface, it forms water droplets (condensation). This is exactly what happens with the moisture in the house, it rises into the loft and during cold weather (typically near or below freezing temperature) it condensates. 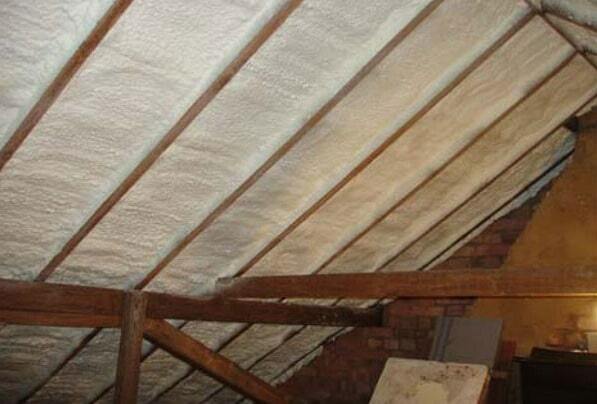 Any extra insulation you add to the ceiling will reduce the temperature in the loft, so condensation may worsen although this is rarely the sole cause. The same applies to loft boards, these also keep the warmth out of the loft, making it colder and more susceptible to condensation. 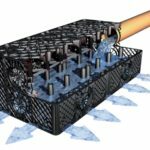 This explains why most cases of problematic condensation affect either new well-insulated houses or older houses that have just had their insulation upgraded. The loft space should have adequate ventilation to prevent the build-up of moisture to an unacceptable level. 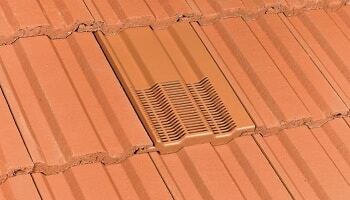 These vents are usually located at the eaves (the lowest part of the roof). Unfortunately, placing boxes and possessions in the loft can disrupt the airflow and render the vents useless. Some homes have a hot water tank placed in the loft, if you have one of these, it’s worth double checking that steam isn’t being released into the loft. 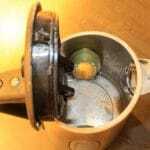 We have seen one case where a faulty thermostat was causing the water to boil constantly and the steam was condensing on the underside of the felt. First check for any obvious signs of water ingress that could be increasing the moisture levels in the loft. Broken roof tiles, leaking pipes and cracked roof leadwork are common culprits. Check that any ducting from extractor fans haven’t come loose. 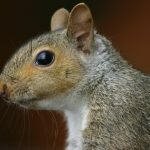 Have the roof checked for leaks and repair them as required. Inspect any plumbing pipework in the loft for leaks. Ceiling downlighters and pipework passing through the loft and into the rooms below can also allow moisture to pass through, so these should be sealed appropriately. 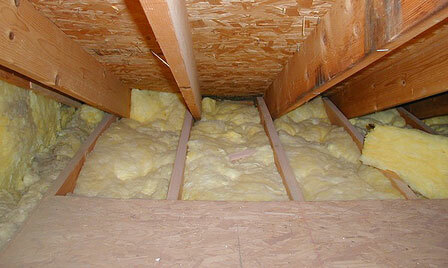 Seal/insulate loft hatches if they are not already. As already stated, moisture will condensate when it comes into contact with a cold surface, so if there’s more moisture in the home, there may be more condensation in the loft space. It is also worth noting that homes with young children/babies often suffer from excessive moisture, this is because newborn babies need to be kept in a warm home so windows are rarely opened and clothes washed frequently and bottles and equipment boiled often. Hanging clothes causes damp and condensation in so many homes that many landlords create tenancy agreements stating that tenants must not dry clothes indoors. Loft condensation is made worse by a lack of ventilation in the home. It goes without saying that during the winter months, most homeowners keep their windows shut. It’s therefore important that window trickle vents are installed and opened during the cold months. Wall vents should not be blocked and kitchen and bathroom extractor fans should be used where possible. Windows in unoccupied rooms can be partially opened to allow the room to breathe. Double glazing and wall insulation all help to keep the house warm but can prevent moisture from escaping, so it rises to the loft and condensates. What’s the Difference Between “Normal” and “Excessive” Condensation? It’s perfectly normal for the loft to generate some condensation during a cold snap. This could be made worse by a lack of wind, as this reduces the airflow through the loft vents. It should however clear when the temperature rises and the wind increases. Excessive condensation would be where it forms during warmer weather or doesn’t clear at all during the winter. If the loft feels damp, mouldy and stale with visible signs of fungal growth to the timbers then this could be as a result of excessive and problematic condensation forming. It’s normal for lofts to experience some condensation, especially during periods of cold weather, but it should be adequately vented so the moisture soon clears. The following types of loft ventilation can be installed from outside of the roof, so should be fitted by a roofing professional. 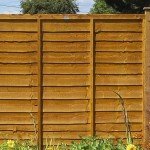 Don’t forget; these products don’t work so well during calm weather when there’s no wind or draft. 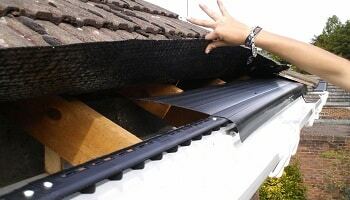 Ridge vents are placed at the very top of the roof and should be used in conjunction with ventilation lower down the roof. These ridge vents act as an exhaust, moisture is pushed out of the loft via the ridge vent. 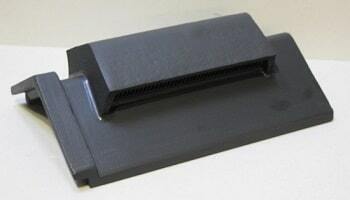 Vents can also be placed midway up the roof, these are fairly cheap to purchase and any roofing contractor should have the skills to install them. The eaves is the lowest part of the roof and most houses should have an eaves vent system fitted, either to the fascia or the soffits. 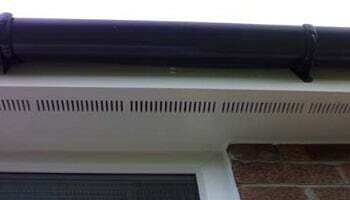 These are installed to new houses and also when new roofline fascias and soffits are fitted. They should ideally be used in conjunction with vents further up the roof. The products we have mentioned so far need to be installed from the outside of the house, that means ladders, possibly an access tower scaffold and/or walking onto the roof. There is, however, one product that you can buy online from Amazon and install from within the loft. The product is a lap vent and is designed to open up the overlapping felt so an airway is created. 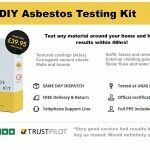 This product significantly increases the airflow through the loft, is cheap, easy to install and can be purchased from Amazon. Lap vents are the easiest, quickest and cheapest way to add extra vents to a loft that is experiencing condensation. We have already provided details of products that can be fitted to your roof to release moisture and reduce condensation but the next step is to try and reduce the amount of moisture being generated in the first place. If you are experiencing high levels of condensation in the loft, then you really should start by asking yourself where this moisture is coming from and how you can reduce it before it rises into the loft. 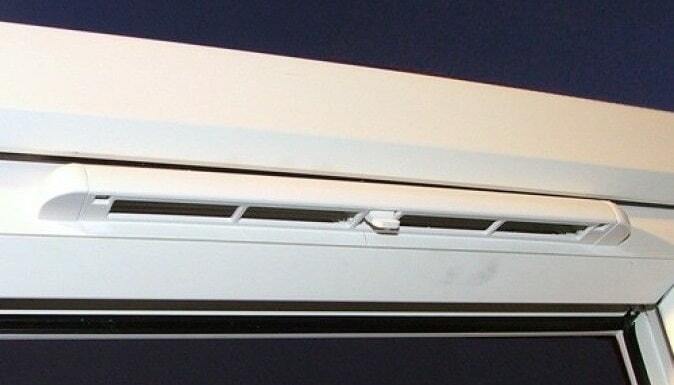 avoid drying clothes on radiators and when you do, try to keep a couple of windows at least slightly open. An article by the Daily Mail newspaper suggests that moisture levels in the home increase by up to 30% when washing is dried on radiators. showering and bathing should be done with the door closed and a window opened afterwards. Make use of the extractor fan if you have one and if it’s not working efficiently, upgrade it to a better one. when cooking and boiling water in the kitchen, keep windows at least slightly open and again make use of extractor fans. be mindful that any moisture you create in the house must go somewhere and if you don’t make an allowance for this, it will rise into the loft and during the cold winter months will condensate on the first cold surface it comes into contact with. By drying clothes on radiators you are increasing the moisture levels in the property by up to 30%. If you have the windows closed during the winter, the moisture will remain in the home and condensate on cold surfaces such as window panes, cold taps and the felt in the loft. Excessive loft condensation is often (but not exclusively) the result of an imbalance between insulation and ventilation. Many houses constructed before the 1980’s don’t have any loft ventilation because the house is so poorly insulated and it’s just not needed. Upgrading the insulation to these houses can lead to condensation in the loft, and as such, ventilation should be installed or upgraded along with the insulation. Unfortunately, insulation installers rarely have enough knowledge or expertise to calculate the required ventilation when upgrading the insulation. It should be noted that in some homes, it may be impossible to completely eradicate loft condensation but your goal should be to reduce to an acceptable level i.e when it only forms mildly, clears quickly after cold weather and doesn’t lead to mould or rot to the roof rafters. Every property is different and some well-ventilated buildings never experience condensation. One of the first things many DIYers do when they see condensation up in the loft is to add extra layers of insulation above the ceiling. 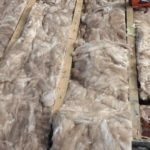 While this insulation is great at keeping warmth in the home, it’s not a water barrier, so moisture will still pass through into the now even colder loft space and condensate. Excessive amounts of insulation can actually make the problem worse. We have already discussed this but it’s worth mentioning again, the loft isn’t designed to be a storage space and too many boxes and possessions in the loft can disrupt the airflow. Too much insulation and too little ventilation can lead to high moisture levels in the home. This isn’t ideal at any time of the year but during the cold winter months, it will lead to condensation somewhere. Avoid blocking air vents, open up window trickle vents, don’t cook/bath/shower without thinking about ventilation. Don’t dry clothes on radiators during cold weather spells, if possible use a tumble dryer and if not, keep a window at least partially open to vent the moisture. 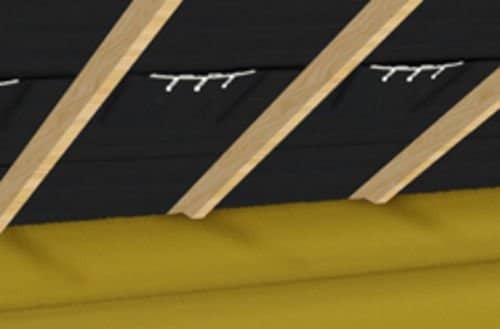 As previously stated, insulation placed above the ceiling reduces the loft temperature and can make condensation worse, but removing the insulation isn’t the best course of action, it would be more appropriate to increase the ventilation and allow the excess moisture to escape. 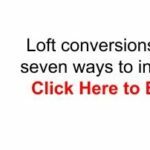 The following steps could reduce or eliminate loft condensation but only at a considerable cost. 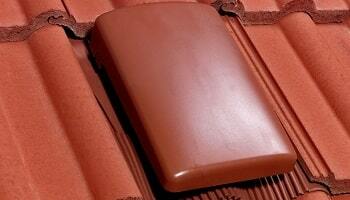 if the roofing felt isn’t breathable then have it removed and replaced with one that is. This will involve removing all the roof tiles, replacing the felt and retiling, so scaffold will be required. have the ceiling removed and a waterproof barrier fitted to the ceiling joists, then install a new ceiling. have the roof converted from a “cold roof” to a “warm roof”. This involves the removal of all installation above the ceiling and new installation placed directly underneath the roof tiles. You are effectively converting the loft space to a warm environment where moisture will not condensate. 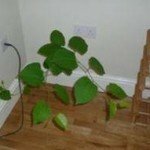 Why is there condensation in my loft? We hope you found our guide to solving loft condensation helpful. What is the REAL Cost to Board a Loft For Storage?